Juvenile Ring-billed Gulls (Larus delawarensis) are quite distinctive within their range, but anyone who's ever spent a little time observing this age group quickly comes to the realization that characterizing a "typical" youngster is no simple task. The late Claudia Wilds felt that Ring-billeds show the least amount of geographical variation of all North American gull species. Although the various populations across North America bear close resemblance, Wilds' statement should not be understood as a lack of intraspecific variation in juvenile plumages. Indeed, this is generally true with many monotypic gull species as they arguably appear to come together and show less variation as definitive adults. With this in mind, I feel the literature has put little emphasis on what I've found to be an impressive array of aspects found in juvenile Ring-billed Gulls. Is this variation a known and accepted phenomenon or is it taken for granted? Juvenile Ring-billed Gulls. Both photographed in Chicago, IL on 26 July 2013. In this post, I attempt to describe 2 juvenile types that may be thought of as opposite points along a spectrum. Although somewhat cursory, it's my hope that this proposed spectrum will drive others to examine this age group in more detail. The following examples are limited to individuals thought to be from one to three colonies near the Chicago lakefront (all within an approximate 15 mile radius). Fledglings in this region begin to appear in late June and peak in late July. Ghost-type (1) - As the name implies, this aspect is notably pale with a strong white ground color. The underparts, head and neck tend to show limited brown washing. The scapular feathers usually show an indistinct pattern. They're often boldly edged and based with white, giving the brown centers a golden appearance. The tertials can show a considerable amount of white, especially closer to the tips and along the edges, and the primaries are more likely to show pale tips; Both of these feather groups can show an intricate pattern of dark subterminal diamonds surrounded by white notches. Juvenile Ring-billed Gull (ghost-type). Chicago, IL. 26 July 2013. An extremely pale individual. Note the overall white ground color and limited brown wash to the underparts. The scapular feathers are small and indistinct. The tertials show a striking amount of white and most of the visible primaries are also tipped with white. This pale individual shows more brown on the tertials. Note the notched pattern to the tips. The primaries also have dark subterminal tips in the shape of a diamond, surrounded by white notches. Juvenile Ring-billed Gull (ghost-type). Chicago, IL. 27 July 2013. A crisp individual with more neatly patterned upperparts. Note the boldly white-tipped tertials with white subterminal notches and similarly patterned primary tips. Brown-type (2) - The general appearance of this type is a dark, chocolate-brown aspect. The most distinctive feature of this group is the large scapulars with solidly dark centers. The tertials are mostly plain and resemble the scapulars but are often a few shades darker. The greater coverts are more likely to show an even silver-gray throughout. The primaries are less often tipped with white compared to ghost-types. The underparts, head and neck show varying degrees of dark wash (this feature varies considerably and might be influenced by fading, wear and the onset of the first prealternate molt). Finally, I would suggest that this group is more likely to first acquire gray post-juvenile scapulars and upperwing coverts in late summer. Juvenile Ring-billed Gull (brown-type). 16 June 2012. Tinley Park, IL. A typical brown-type with prominent scapulars showing plain and solid dark centers. The tertials are plain and the greater coverts are dressed in gray. Note the early date on this individual. Juvenile Ring-billed Gull (brown-type). Chicago, IL. 26 July 2013. Much like the bird above, this brown-type also shows large dark centers on the scapulars. The tertials are plain and are a few shades darker here. The greater coverts are mostly gray. Also note the lack of any notable white edging to the primaries. 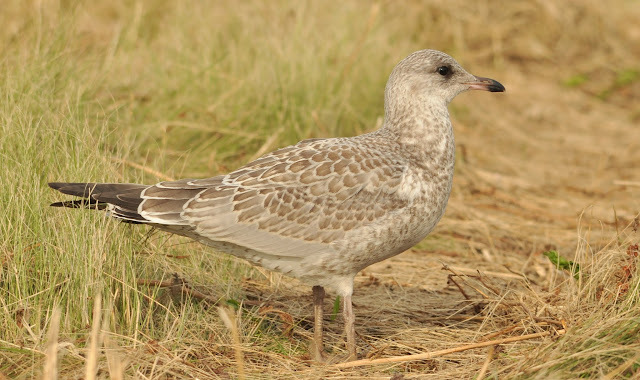 Juvenile Ring-billed Gull (brown-type). Blue Island, IL. 04 July 2013. As expected on this type, the scapulars are relatively large-looking with solidly filled brown centers. The tertials are plain and may appear a few shades darker than the remaining upperparts. The greater coverts show a blend of silver-gray. On average, the primary tips are less likely to have white tips when compared to ghost-types. An important note here is that the aspects of these plumages quickly become altered shortly after the summer months due to the expected consequences of wear, bleaching and the commencement of the prealternate molt. The patterns that I've described above are based on my own personal observations from the last four summers. A mixture of characteristics from both types is commonly found on some individuals. I should reiterate that these two types appear to be on opposite ends of a variable spectrum- a spectrum that should be thought of as a work-in-progress.